Finance Minister P. Chidambaram stated in January that the current account deficit (CAD) was the “worrying” kind. In the second quarter, ending in September 2012, it registered US $23 billion or 5.4% of gross domestic product (GDP). The financial year ends on March 31, 2013. The government does not want to repeat its 1991 fiasco. The CAD then reached 3% percent of the GDP, and India came very close to running out of foreign currency. We had to rush gold bars by air to Europe so they could loan us foreign currency. So, what is the current account (CA)? The current account appears on the government’s financial statements and consists of three parts: foreign trade, income, and direct transfers of capital. Foreign trade is the largest component of the CA. It shows the amount of exports and imports. When we buy more goods and services from other nations than we sell to them, we have a trade deficit. When the opposite occurs, we have a trade surplus. The final part of the CA is the direct transfer of foreign currency. It contains foreign aid and grants given by India to other countries, loans made to foreigners by our banks, direct investments made abroad by Indians, and wages remitted by foreigners living in India. 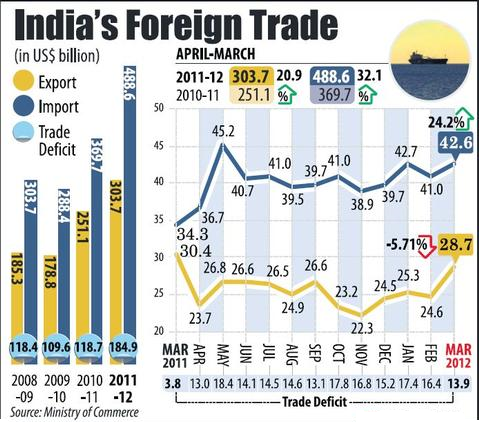 Currently, India has a large CAD mainly due to its trade deficit. We import lots of oil and gold. The total exports from April 2012 to January 2013 was nearly US $240 billion and the total imports in the same time period were US $407 billion, creating a large trade deficit of US $167 billion (Rs. 9,01,800 caror) in nine months. So, what can the government do to reduce the CAD? We need more inflow than outflow of foreign currency. As you would expect from the above listed components of CA, we could ask Indians working abroad to remit money to India, increase exports, reduce demand for gold and imported oil, and very selectively and prudently increase foreign investments. The finance minister is advocating an increase in import duties on gold to dampen its demand, hoping it will reduce foreign currency outflow. We have been importing more and exporting less for quite some time. Consequently, the CAD has been growing, and both our currency (rupee) value and our standard of living have been deteriorating. To find solutions to the CAD and our other structural economic problems, we need educated, experienced, traveled, well-read, and penned leaders. In our nation, the majority of economists, financial experts, chief ministers, state and central government ministers, members of states legislative assembly, and the members of parliament do not understand economics or the intricacies of our economy. If you think L. Advani, P. Chidambaram, Rahul Gandhi, Nitish Kumar, Narendra Modi, Sushma Swaraj, or Akhilesh Yadav, just to name a few, would make a good prime minister, then think again. And think hard.